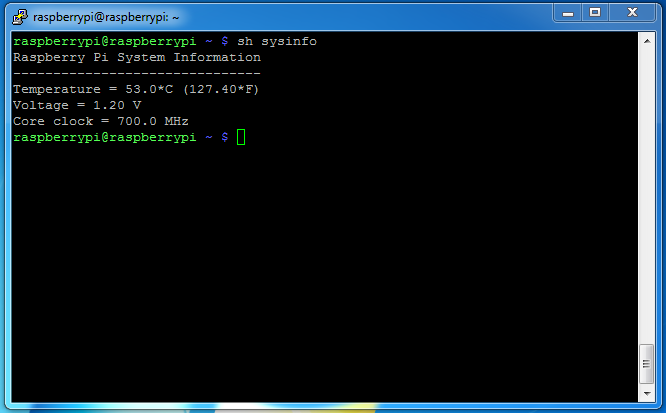 These instructions are for compiling cgminer on Raspian (a debian distro for the Raspberry Pi). If you encounter any problems, it’s likely because your build environment is different (or I forgot something). Leave a comment or message me and I can try to help. 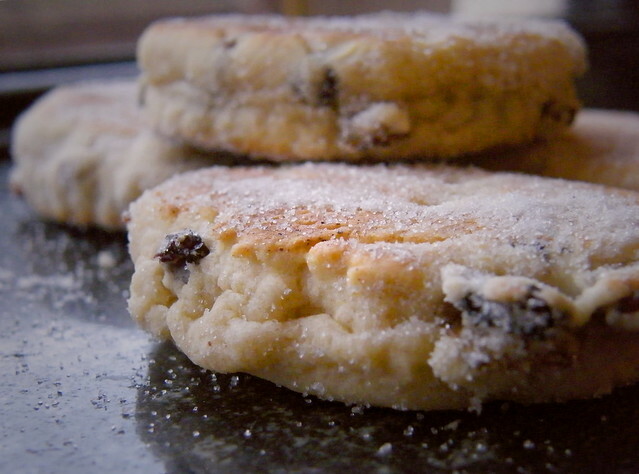 I took the opportunity on my recent visit home for Thanksgiving to try out a recipe for Welsh Cakes in preparation for this year’s International Festival. After making two batches, the first of which was devoured shortly after leaving the griddle, I can safely pronounce them a rousing success! What is great about them is that they are easy and quick to make; once you make them a few times, it only takes about 35 minutes from start to finish. The ingredients are also simple to come by: nothing far out of the ordinary. Sift the flour, mixed spice, and salt into a bowl. Cut up the stick of butter into chunks. Then press the butter into the flour mixture by hand or pulse it a few times in a food processor. It should be sort of crumbly. Add in the caster sugar, lemon zest, and raisins. Crack the egg into a ramekin or small cup and beat it with a fork until the yolk is mixed with the whites. Stir the egg into the flour-mixture. If the dough seems too dry, add a small amount of milk. It should be firm and slightly sticky. Roll or press the dough onto a floured surface to approximately a 1/4 inch thick. Personally, I find pressing it into a large square and cutting into 9 pieces is easiest, but you can also use a round cutter. Cook the cakes on a medium-hot griddle or heavy frying pan for about four minutes per side. They should be golden on both side and soft in the middle. Then dust with caster sugar. They taste fantastic while hot off the pan, but can be saved for about a week in an airtight container (though I don’t know how they would last that long without being eaten). You can also eat them with a little butter or jam on top. These three things are not typically found in the average kitchen in the US, so here’s how to make them. Mixed Spice: Mix together 2 teaspoons allspice, cloves, ginger, and nutmeg. Add in 1 tablespoon of cinnamon and 1 teaspoon each cardamom and coriander. Caster sugar: This is super-fine (but not powdered) sugar. All you need to do is take regular granulated sugar and stick it in a food processor or blender for a few seconds. At $5 a pound at the supermarket, it’s a lot cheaper this way. Self-rising flour: This is easy to make as well. 1 cup of all-purpose flour, 1/2 teaspoon of salt, and 1.5 teaspoons baking powder. That’s it! During the course of the Great War, many traditions of the British were forsaken in light of the rapidly changing times. The horrors and alterations brought by a world at war affected more than just social constructs— they went as far and deep as changing and restructuring literary tradition. The writers in this new ‘Modernist’ period of literature sought to revive tradition by, ironically, dismissing older forms and subjects. The new experiences of large-scale and civilian warfare, of “a new patriotism, richer, nobler, and more exalted”, and of rapid changes in culture and morals brought into play fresh subject matter for the prose and poetry of a budding century. Whereas the central theme of the preceding Victorian era was the conflict between faith and doubt, the Modernists contemplated the topics of their day, which nearly always stemmed from the unprecedented scale of the wars that filled the first half of the century. T.S. Eliot’s poem “East Coker” embodies this new archetype of literary tradition by incorporating experiences from both World War I and II, and in doing so helps to shape the path of Modernist literature. Here Eliot paints a scene of the war ravaged British isles, many of its structures ripped asunder by the German bombers. The air raids throughout the Great War were a real and present danger alive in the minds of all the British citizens. Every night was filled with fear that a bomb would hit the family home— the children were sent to live deep in the countryside. In the first three lines Eliot adeptly makes use of enjambment to amplify the effect of the broken houses and fear. By splitting the sentence across lines without punctuation, it breaks the flow of the poem, echoing the brokenness of dwellings. Eliot also speaks to how society was never able to truly recover to its pre-war state. Indeed, according to the War Cabinet, Reconstruction “was ‘not so much a question of rebuilding society as it was before the war, but of moulding a better world out of the social and economic conditions which [had] come into being during the war’.” Just as new social and economic conditions changed during the war, so did the literary form and matter in the mind of Eliot. When he mentions, “Old stone to new building, old timber to new fires” he is signifying this change, suggestive of how many buildings were converted to factories to aid the war effort during both World Wars. Again, Eliot uses line enjambment to echo the broken fields and villages that could be found anywhere caught in the crossfire of the Great War. Towns were left in “empty silence,” the inhabitants evacuated, leaving behind a solitude in between skirmishes. 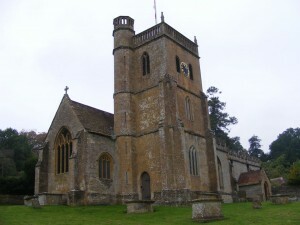 Here he also uses multiple stressed syllables to break from the usual iambic pentameter, such as, “deep lane,” and “afternoon.” Eliot breaks from using iambic feet like many other poets do and it gives the poem and unusual twist, causing the reader to focus in on the lines and drawing you into this mysterious, silent village. Another theme that T.S. Eliot may have been commenting on is the degradation in morals that Britain underwent in the early twentieth century as a result of the World Wars, namely a sharp increase in promiscuous behavior and illegitimate children. Whereas the Victorians had very strict views against sexual contact outside marriage, the horrors of the wars deteriorated the religious objections held by many. We read that, “the religious teaching that the body was the temple of the Holy Ghost could mean little or nothing to those who saw it mutilated and destroyed in millions by Christian nations engaged in war.” In “East Coker” Eliot writes about, “The association of man and woman / In daunsinge, signifying matrimonie— / A dignified and commodious sacrament”. By using archaic spelling here, he could be drawing a connection to how the idea that sexuality was to be kept for marriage is an old convention and unneeded—at least in the eyes of the lower and middle-classes. The traditional theme of a struggle between faith and doubt takes on a different focus when viewed through the lens of a post-War poet. In merely a few lines we get a sense of how much the hostilities affected the core of British culture by effecting a change in religious mores. Thus it is that we see how Eliot adeptly uses a change in literary form and theme to revitalize literature and weave a new tradition that relies upon incorporating the grand social changes that were born out of the Great War rather than employing the structures of old tradition. His use of enjambment to convey the brokenness of a war-torn Europe is especially striking, as is his utilization of antiquated spelling and words to remark upon the revolution of religious morals— chiefly regarding sexuality. Ironically, Eliot’s move from the old traditions was able to bring in fresh ideas presented with more depth and breadth than was formerly done; it is a lesson we would do well to remember. Arthur Marwick, The Deluge; British Society and the First World War (New York: Norton, 1970) 49. T.S. Eliot, “East Coker” Handout, 123. We meet again my fellow friends, bloggers, and random people visiting this website (Don’t think about it). I am sure we have both had our numerous and spontaneous meetings with adventure, like when a person is informed they have jury duty. Ahhhh, the surprise and joy of it all! For if I know half of you half as well as I should like, and I like less than half of you half as well as you deserve, then I am sure you all have had some wonderous adventures since our last parting. I am sure you all have had exploits involving great mounds of treasure, rescuing D.I.D.’s, enjoying luscious golden manes of hair and fighting villainous paper topics. But before I hear all the delicious and moist details of those tales and travels, please allow me the quick pleasure of explaining of mine. My recent adventure has reconciled myself and one of my oldest foes, classical music! Yes, I know the horror must be immense to the vast majority of readers who read the previous line but now I will regrettably increase it tenfold with the following statement. Classical Music and I have become allies,and started down the road towards friendship! Where did this sudden develop begin one may ask? The answer springs from a need for non-distracting music in the background while studying in a spacious lounge with companions and Ethureans. The little music on my companion’s computers, as well as mine was quickly used up within the first day of our new study location. Hence, I searched and found out I could check out classical music from the music department. Callooh, Callay! What a joyous day, at least it was up until I actually dived deep into the classical music pool. Where I then proceeded to quickly drown like a rock thrown into a pond, an extremely deep chasmic pond. I was drowning from not knowing where to begin, what to listen to, and even being able to spell Tchaikovsky’s name! Luckily, a musically inclined friend of mine by the name of Joe Giallombardo gave to me the following guide as the life-preserver to the tumultuous waters and understand the world of classical music, which I now present to all of you to enjoy! This is an attempt to make the Definitive guide to what is commonly referred to as Classical music. Basically, its a list of the greatest music written during this time, accompanied by technical, historical, and philosophical explanations for what you’re hearing. Its grouped by composer, and the composers are chronologically ordered. These, in turn, are grouped into the three major periods of musical history from this time: Baroque, Classical, and Romantic. Music has been around forever, but it wasn’t always viewed as a form of art. It was always voice-based in ancient, Medieval, and Renaissance times. Music was used for religious means, not always available to the public. One important exception was in the school of the Pythagoreans in old Greece, who saw a metaphysical connection between music and physical reality. Basically, they thought that certain natural phenomena reflected the mathematical proportions on which a musical chord is based, like the movement of the stars and planets, or the changing seasons. This train of thought hit the musical world a couple hundred years later, and that’s where we begin! Most of the music here is instrumental and secular, but there is also some sacred music as well. While I do put them into a time period, the music here is immortal and expresses such deep mystery that it is impossible and unfair to completely categorize each of them. The fusion of divine mystery with popular art in music began with Pachelbel. Pachelbel wrote a lot of music, but most of it was nothing new. His Canon in D (which you know and love) was a bit of a “one hit wonder.” To my knowledge, it was the first piece of music that became immediately famous and popular across the western world. The Baroque Period was heralded in by the invention of “polyphony and counterpoint.” This simply means that two different musical progressions are going on at the same time, that, while independent, flow harmoniously when played together. In this idea of different sounds combining to make layered music is the germ of all great music to come. Pachelbel lived with the Bach family, who were famous for being great organ players. He tutored Charles Bach in music, and when he went to his wedding towards the end of his life, he met Charles’ young nephew, Johann Sebastian Bach. Pachelbel took a liking to the kid and the young Bach was fascinated with the well known composer. Bach was the first great giant of the musical world. He mainly specialized in writing impressive solo pieces. See if you can notice the common things he does in all of his music. More about what he brought to the Baroque Period later. Bach set a lot of trends. In Baroque music, the composer focused on one musical idea and focused on it solely throughout the piece. The allegros (faster moving pieces) are characterized by constantly moving different strands of music, equal in prominence. They had less instruments to work with (for example, the piano wasn’t yet invented) and music was very string or brass wind heavy. Listen for these things more obviously in the next composer. Handel composed in England, though of German descent. (For a long time, most great composers were Germanic or Italian.) Handel composed for the English royalty, which gives a very regal flair to his work. A big recurring devise in his work is reflecting and repeating the same progression of notes, and layering them together. Even though the Messiah is choral, there is an emphasis on the music rather than words. There are a few words repeated, and the song is a musical exploration of the meaning of the words. This is very different from the modern conception of lyrics, in which the music is made to showcase the words, rather than explore them. Vivaldi was the culmination of the early Italian school of music, which emphasized a vigor of passion and vibrancy of contrasting sounds. Nobody loved the violin more than Vivaldi; you’ll hear how string heavy his pieces are. Vivaldi was a priest; however, because of terribly ill health, he was given allowance to withdraw from his priestly duties. While he was sick he began composing music to be played at the nearby orphanage. The Classical Period is where music really grew up. There were several major shifts. The first of these was away from pure polyphony (the idea of having equal and independent musical progressions playing at the same time). This was replaced by a series of intimately interwoven progressions of music which were layered beneath a dominant melody. There was a greater focus on chords and layers different types of sound and instruments. The piano was invented! (Yay!) New forms of music were invented. Mozart was the Shakespeare of the musical world. Up until now, the great music had always belonged to the aristocracy. Mozart made music accessible to the common man, and the common man flocked to him. In order to earn enough money to work for himself (Mozart hated bosses), he toured across Europe, performing his own pieces while also conducting them. He massed a huge fan base, and became an international star. He thus combined pop culture phenomenon with enduring art. He combined the imagination of the Italian school (where he was trained) with the form of the Germans, and created the pinnacle of the Classical form. Mozart explored two new forms: the Symphony and the Concerto. 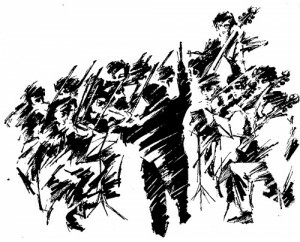 A Concerto is a piece for a solo instrument which is accompanied by an orchestra. You know what a symphony is ;). He also wrote sonatas, operas, and serenades. Mozart’s music had more different instruments playing more different things at once than anyone before him. Critics said it was too many notes, too complicated; but Mozart knew better. He believed that music was there to express mysteries that words could not describe. The complexity lends itself to mystery. There is so much going on in a piece of Mozart’s music, that you could listen to one every day for the rest of your life, and notice something new every time. I’m not exaggerating!!! He wrote 626 published works! Well, here’s some of his best stuff. Notice the fusion of human passion, order, and at times, divine mystery. Now watch this video. The same song with the translation of the lyrics and corresponding pictures. From the Requiem Mass, which he wrote on his own deathbed! Mozart’s work was that of a young man. He was in bad health on and off in his life, and he died at the age of 35, in the middle of writing his Requiem Mass. Towards the end he became worried that he was dying and told his wife that this would be his own Requiem. He fell ill during the performance of an opera of his, and threw himself into the work of finishing the Requiem. Some say he worked so hard on the piece that he didn’t give himself the chance to recover. No one knows why he died. The most extravagant explanation was that he was poisoned by rival composer, Antonio Salieri, who wanted to claim the Requiem as his own. This is probably not true, although Salieri did have a nervous breakdown about the accusations of such and ended his life in a madhouse. Beethoven is the hardest to classify, as he is the most truly unique composer of all time. Mozart represents mathematical perfection of order. Beethoven, while not as refined, expresses things which no one else has ever dared to try to express. As such, I call him an “existentialist musician.” He grew up listening to Mozart, and was deeply influenced by him. Then he famously went deaf, and it seemed that his career was over. He considered suicide, but instead removed himself from society and took what was basically an extended retreat by himself. He spent the time in deep prayer and artistic reflection. He came back and immediately produced his 5th symphony, perhaps the most famous piece of music ever. Beethoven had discovered that, while he was not able to hear, he could still feel music physically vibrate. He would put his hand in the side of a piano or other instruments to feel them resonate. It was on the resonating that he would base the rest of his work. This is why he thought of sounds that other hadn’t contemplated before. I think he is the second best composer of all time, just slightly behind Mozart. Beethoven sparked the transition into the Romantic Period. He is not, however, a romantic composer. Rather, they would later try to emulate him. Symphony 9 Also the first choral symphony. Includes “Ode to Joy”! Also, composers began to experiment with increasingly dissonant and unusual chords in search of newer sounds and greater contrast. The two best at this were Tchaikovsky and Chopin. Another change is that composers increasingly wrote about particular things as subject matter, like scenes from literature of famous plays, or a particular storyline. Music became more cinematic, focusing on conveying a specific image. Music came more “down to earth.” This makes Romantic music more accessible to the modern ear, but it is also a step down from the more ethereal sounds of the Classical Period. Chopin was the first composer to focus solely on exploring the range of the piano, which was still a young instrument (although Mozart and Beethoven also used the piano a lot.) He is the most Classical of the Romantic composers, as you will hear. His pieces retain a level of subtlety and complexity that most Romantic composers simply were not capable of. Tchaikovsky was the king of Romanticism. He was both the product and part of the cause of a new cultural explosion in Russia, composing at the same time the Leo Tolstoy and Fyodor Dostoevsky were writing there famous novels. He was a personal friend of Tolstoy. Russia had been more primitive than the rest of Europe for years; it had only become a cohesive nation about a hundred years ago (mid-late 1700’s). Russians, particularly the ruling Czars, wanted to emulate the Western culture, and so in only a hundred years, there was a very condensed, intense, and spontaneous birth and growth of both the novel and the symphony in Russia. Tchaikovsky was most fascinated with the music of Mozart, which he believed embodied a mysterious paradoxical combination of the simple and the profound. He sought to emulate the master, but developed a unique style that combined the refined art of the West with the particular existentialist, tortured, passionate and introspective character of the new cultural eruption in Russia. In conclusion, there is something unquantifiable about the greatest music. I have given a very brief and thus inadequate description of the changes in music composition, the philosophy of music theory, and the history of the evolution of music; but in the end, the music speaks for itself. As I said, you can’t fully measure the highest music, because it isn’t purely physical, but also metaphysical. Words fail it, because if we could say what the piece means in normal language, there would be no reason to write the music. As for what truly makes for the highest form of music, I would agree with Tchaikovsky’s assessment of Mozart; that Mozart combined the complex with, at times, blissful, almost childlike simplicity. The combination of the infinite and the simple is exactly what makes up a man, when you think about it… how we are all unique and complex, but we also must strive for that childlike simplicity. This is one of the many, many reasons why listening to such great music is a good exercise for the soul. 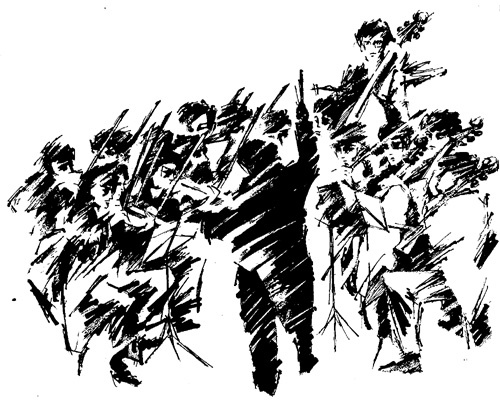 Today classical music has been restricted to the field of cinema. People make music for movies, but not for its own sake anymore. I hope, at least for some people, to carry on that torch from the greater masters before me. Here is a startling beauty which strikes at the core of man’s soul. To be able to produce that kind of beauty, to share it with others– that is the goal of a true artist.